Why do Brad Anderson’s customers (almost) always refer him to their friends? Well, although he doesn’t like to crow about it, as a roof contractor – he’s a craftsman. He works with his clients closely, creating the look they want for the price they need, in the time they have to get it done. So if you want to replace your metal roof and are thinking about Colorbond roofing or metal reroofing, we’d love to speak to you. We would like to thank B Anderson Roofing for the fantastic job well done to replace our two level, tired and leaky old tile roof with a beautiful Colourbond new one. Brad is a craftsman who can turn your almost-perfect home into a thing of beauty. It’s why most of his customers happily refer him to their friends and family. Brad provides a full assessment, free measure and quote and a complete transformation of the look and feel of your home. And a great guarantee, of course! 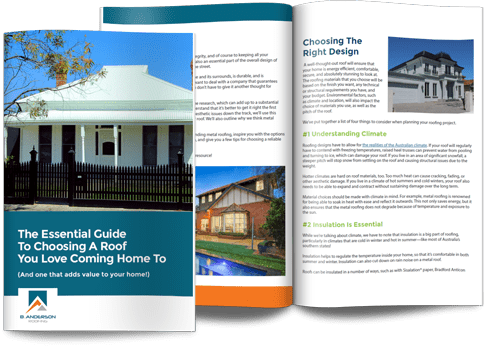 If you want to replace your roof and are thinking about Colorbond roofing or any kind of metal roofing, we’d love to turn your house into a home your neighbours will be envious of! So if you haven’t heard of Brad or B Anderson Roofing it’s time you gave him a call for an obligation-free quote on 03 8680 2527. You’ll be glad you did!